The Point Lima was opened in 2002, as the first real backpacker hostel in Peru. We are located in a beautiful colonial mansion in Barranco, Lima’s most vibrant district, on a quiet side street and facing the ocean, where you can find dozens of shops, restaurants, bars, clubs, and other attractions. Our friendly (English speaking) staff can book attractions for you directly from the front desk. We’re also happy to assist you with purchasing bus tickets or arranging airport transportation once you’re ready to continue on your journey… though we won’t be surprised if you don’t want to leave! During the day, our TV room and courtyard provide great places to unwind and hang out with new friends, or maybe use our blazing fast WiFi to Skype with people you haven’t seen in a while. Our restaurant is open every day, and serves a variety of dishes as well as traditional bar food. 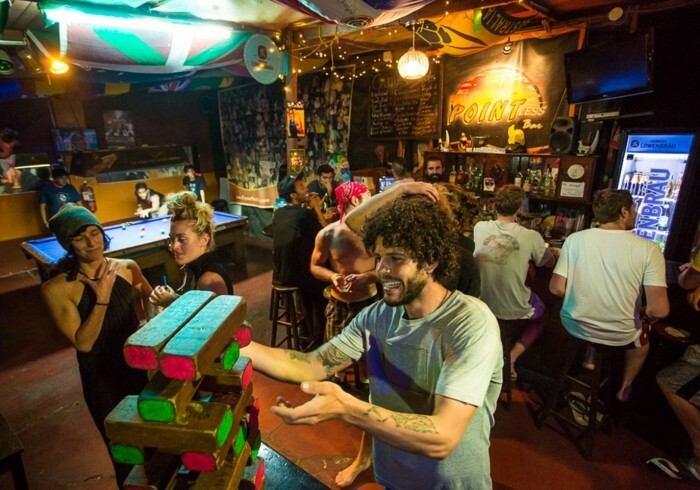 At night, drop by the PointLess Bar to check out the drink specials of the day, and maybe play a few rounds of Beer Pong or Flip Cup. When the bar closes at 1am, our nightlife guide will take you out to a different club every night, where you’ll get free entry as you experience the best of Lima’s nightlife. NEVER SLEEP ALONE!